Riot Fest celebrates its 10th Anniversary this year with three huge North American festivals, including Chicago’s Riot Fest & Carnival, Denver’s Riot Fest & Sideshow and Toronto’s Riot Fest & Expo. Today the organizers of Riot Fest announced the spectacular lineups for these festivals, which will all be headlined by the legendary rock band, The Cure. 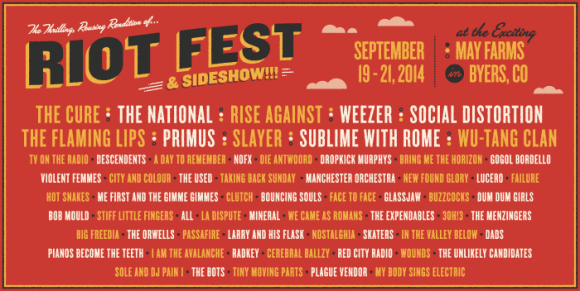 The Denver Riot Fest which takes place from September 19th to the 21st, will also include acts such as The National, Rise Against, Weezer, Social Distortion, The Flaming Lips, Primus, Slayer, Sublime with Rome, Wu-Tang Clan, TV on the Radio, Descendents, A Day To Remember, NOFX, Die Antwoord, Dropkick Murphys, Bring Me the Horizon, Gogol Bordello, Violent Femmes, and many more. The entire lineup can be found below.